The perfect party dish for your guests looks great but is very easy to prepare just before your guests arrive. This is also a treat for your children’s lunch boxes. I made these pastries 5 days ago. I was surprised by the great taste even when cold the tart tasted as good as when it had just come out of the oven. This isn’t a classic Korean dish but the seasoning is Korean style. I’m trying to be more adventurous with my cooking with Jerusalem artichokes. So far they have adapted amazingly well to most Korean dishes. Try using this earth root vegetable in your favourite dish and let me know what kind of other dishes we can create with it. Tip. Ingredients and processing are same as Toran Jeon (Jerusalem artichoke pancakes) except for baking in the oven with puff pastry. Combine the toasted sesame seeds, sesame oil, soy sauce, sugar, ground white pepper, lemon juice, fresh Thai chilli (optional) and pinch of salt to the chopped vegetables. Mix with a spoon and set aside for a minimum of 10 minutes. Preheat to oven to 220°C. Lay the pastry sheet on out on a clean work surface. Cut the pastry to fit your baking tin size and place each and flatten out slightly with your fingers. Scoop a spoonful of the filling mixture (depending on your tin size) on to each tart. I used two different sized tins; one is a Yorkshire Pudding tray and the other one was 12 bun tray. 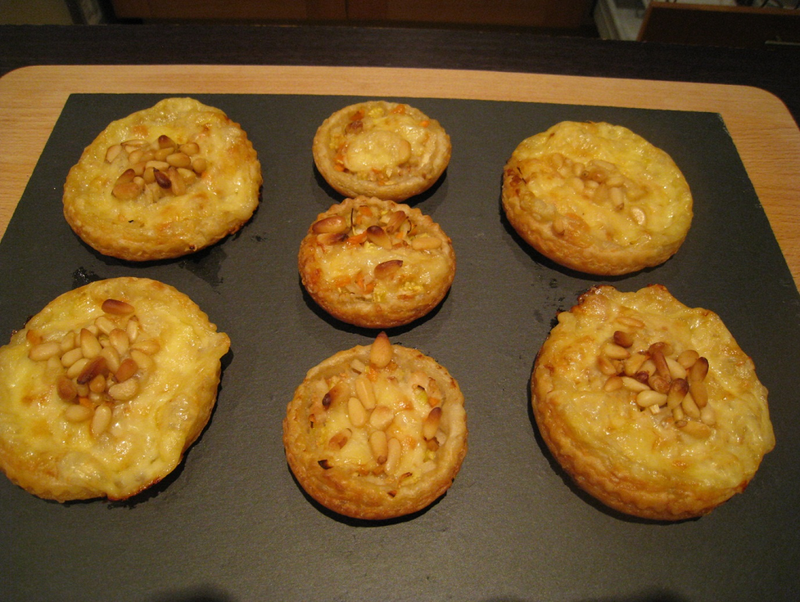 Lay some sliced cheese on top and scatter with pine nuts or pistachios in the middle. Place in the oven to bake for 20 -25 minutes until puffed and golden.